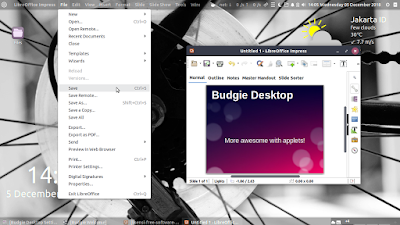 Continuing second part, here I will discuss about Applets which can be added to Budgie Desktop. I highlight several of more than 20 applets available today: NetSpeed, Clocks, Brightness, Alt+Tab, Global Menu, Workspace Wallpapers, Weather, and Screenshot applets. If you wonder what it is, an "applet" in Budgie is the same as "extension" on GNOME or "widget" on KDE Plasma. Now, for this article I make a journey in installing them and putting them around my desktop and I have much fun. I really love to see things that I didn't see on another desktop environments before and I find many here. Who know that we can still use global menu even in Budgie, considering Unity has been dropped and Budgie itself is still new? Who know tif here is a splendid screenshot tool (with more features than built-in GNOME Screenshot) created solely for Budgie? I won't know until I tried them. I hope it will be more interesting for you this time and you can go try them now. Enjoy! Budgie Welcome is not a part of Budgie Desktop. 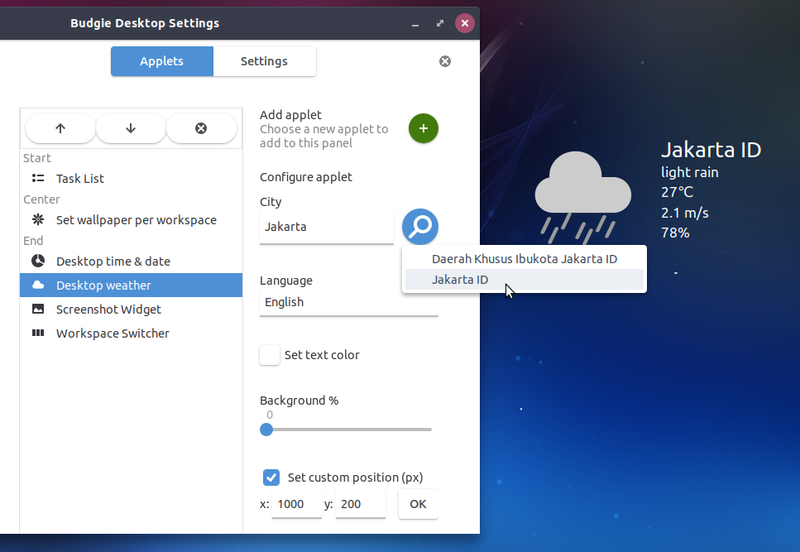 It's a program developed by Ubuntu Budgie developers. 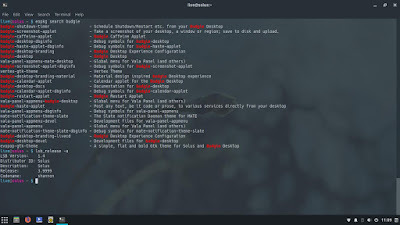 In this case, you won't find Budgie Welcome on Solus OS, the origin OS of Budgie Desktop. 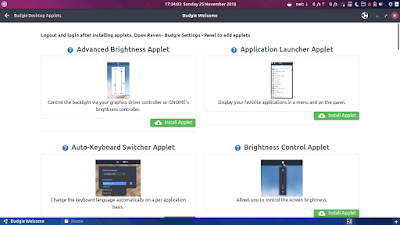 Anyway, this program helps you a lot to find and install Budgie Applets (called "Extensions" on GNOME or "Widgets" on KDE). Once you run it, click Install Software > Budgie Applets > and applets selection should appear. and more, you can find the rest by keyword "budgie applet" in GitHub. 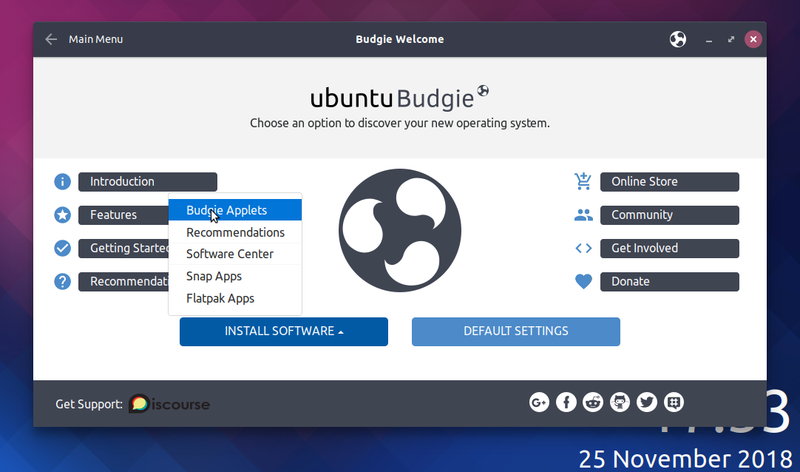 Here's Ubuntu Budgie's Budgie Welcome program. You can see this selection page of Applets by clicking Install > Applets. 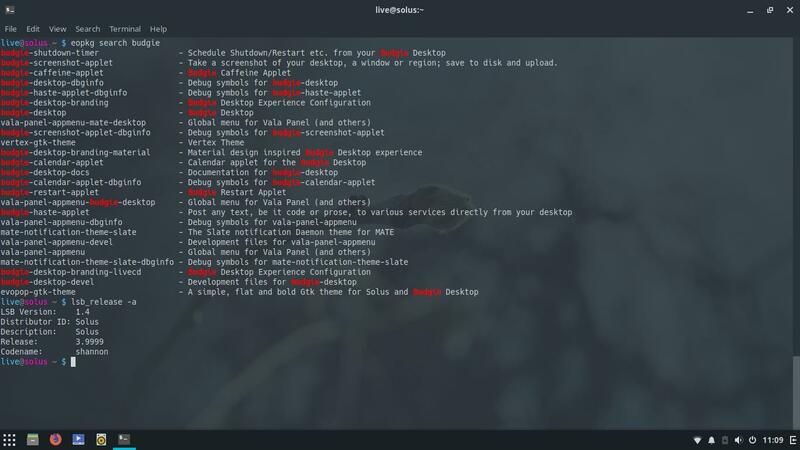 On Solus, there are only some applets already available in the eopkg repo. On Ubuntu Budgie, fortunately, all applets are already included within aforementioned Budgie Welcome. You see, there is an applet named budgie-haste-applet. 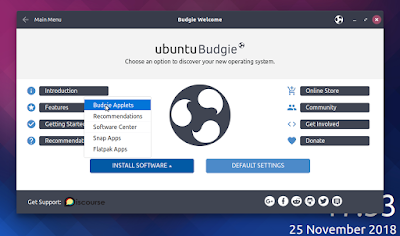 Click Install Applet button on the Budgie Welcome program. To enable an applet, use Budgie Settings, go to Panel section, and press ' + ' button to add one. Use up and down arrows to move an applet up and down in arrangement. See this Gif animation for example. Now, I will highlight some applets I feel interesting. After this, feel free to have another journey with the rest of applets not mentioned here. Enjoy! Perhaps some of you knew that this is the kind of applet I love the most. With this, you know upload/download speed, so you know how your limited internet data plan being spent. 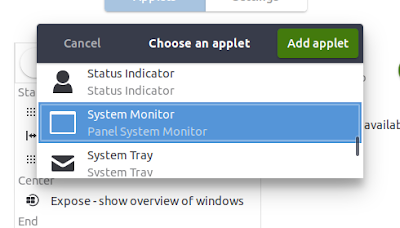 However, the official name is System Monitor. You can display multiple different clocks (e.g. for your overseas team members) with this one. Click + and you get new clock. Click magnifier icon and your browser appears with world map https://www.timeanddate.com/time/map/ to help you determine the time zone for each clock. Each clock time zone is determined by +[number] or -[number], for example, +7 for Jakarta/Asia and -7 for Denver/USA. This way, all will show accurate times for each name of members you write on bottom of each clock. For me who live in Indonesia (a country with triple time zones), this is useful. Honestly, it's my first time seeing two sliders on one brightness controller. They are Light and Dim sliders, with 0-976 and 10-100 scales, respectively. If you scroll down them both to zero, your screen will get completely black. However, its Github page doesn't explain more about how it works. This applet replaces the original Budgie's Alt+Tab switcher to have window thumbnails. Honestly, I like thumbnail style better than just icon style like the original one. However, on my machine this applet is a bit slow, it delayed window switching. I hope this applet to become faster next time. Now, number of desktop environments that support global menu is increasing with Budgie Desktop as it has the applet. 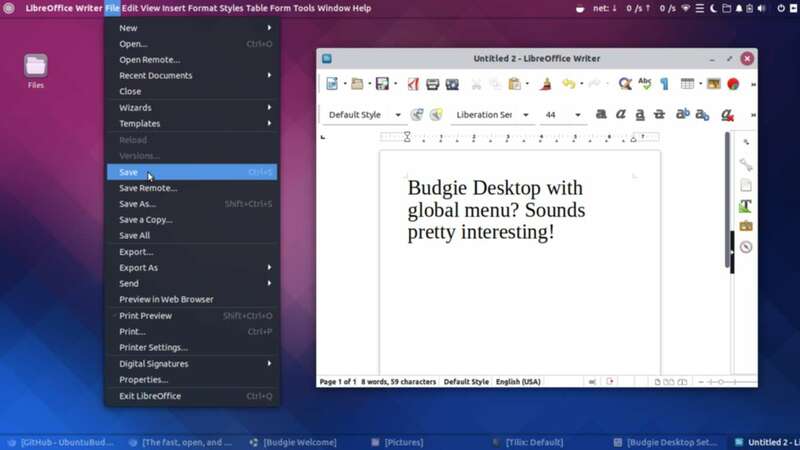 We know that GNU/Linux desktop started popularizing this macOS-like feature since Unity Desktop inception (Ubuntu 11.04), followed by KDE Plasma, MATE, and finally now Budgie. If you combine it with transparent panel, it would look perfect. Do you remember old times with KDE when you can place different wallpapers on different workspaces? On Budgie Desktop, you can do it again thanks to Workspace Wallpaper Applet. 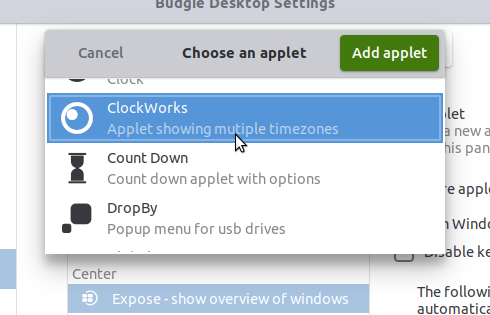 Once installed, restart your machine, and add it up on Budgie Settings > Panel > Add New Applet > choose Wallpaper Switcher. It won't show any icon on panel but now you can change wallpaper on each workspace you have so they all differ. First, you should add Workspace Switcher applet on your panel. Second, add the Workspace Wallpaper applet to panel. It won't show any icon, indeed. Now, right-click on desktop area > Change Background > select a wallpaper. Then, go to next workspace and change its wallpaper too. Do change wallpapers for the rest. Finally, try to switch between workspaces and you should see different wallpapers. 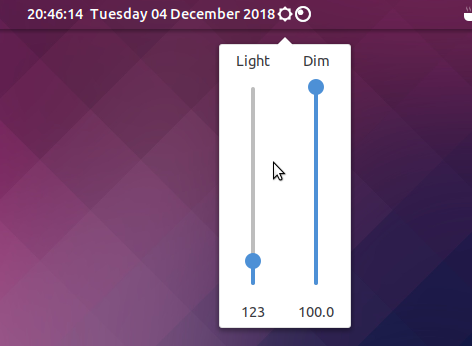 Notice the clock floating on the wallpaper area on Ubuntu Budgie? This applet does the same thing but for weather forecast instead. It's really nice to put this along with that clock. However, of course, to have this works you will need internet access. Hey, really, this one is a splendid applet. It's similar to Shutter Screenshot Tool but smaller and integrated well to Budgie Desktop. It features delay time enabled by default, upload to Imgur directly, custom file name, capturing from different display, and many more. All in this simple applet. So far, this is my favorite applet from Budgie Desktop. Very nice work, Stefan Ric! That's all. I hope this part encourage you enough to have a journey yourself on Budgie desktop. Start with Ubuntu Budgie and have a nice day. Next time, I will discuss about customization including icons and themes. This will also include the Budgie Settings that mentioned above. Happy working!